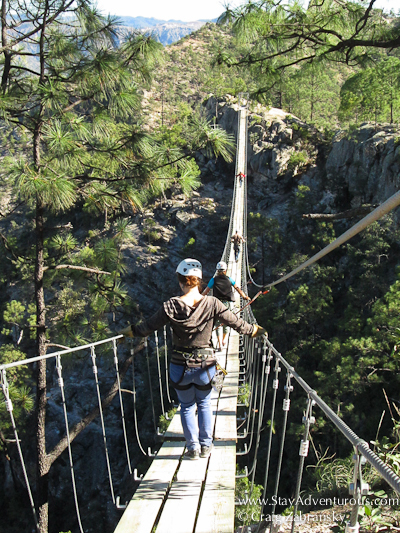 A new adventure park in Chihuahua, the Copper Canyon Adventure Park, set up high speed zip-lines and suspension bridges to allow thrill seekers to cross the Copper Canyon. Sure, for some, the beauty of this Mexican treasure is best appreciated from the train through the Copper Canyon region or perhaps with a cocktail during sunset at a Copper Canyon overlook. I did both. But if you want to experience the Copper Canyon up close, consider the zip-line experience and walking the wooden planks on this bridge. I am SO glad I did. This image is part of Mexican March Madness 2013. This year it is 31 photos in 31 days. Enjoy. Also, I’d like to thank ATMEX and Veracruz TB for extending an invitation for me to attend as press. Gracias. This IS AWESOME! I need to get here asap.